CHANDIGARH: The Punjab hospitality industry has sought an amendment in the Punjab Intoxicants Licence and Sales Orders, 1956, to bring down the legal drinking age from 25 years to 18 years. The industry is seeking this with an eye on the 18-25 age group -17% of the state’s population – to spur liquor sales. 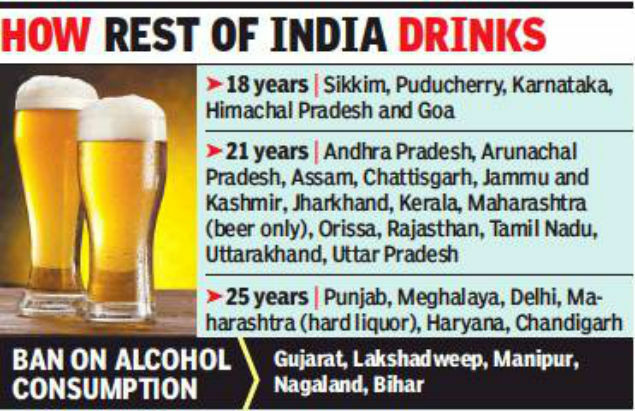 Like Punjab, the legal drinking age in Meghalaya, Delhi, Maharashtra (hard liquor), Haryana and Chandigarh is 25 years while in Sikkim, Puducherry, Karnataka, Himachal Pradesh and Goa it is 18 years. There are 13 states where the legal drinking age is 21 years.